American families across the country have a favorite fried chicken recipe, busted out for special occasions, passed down for generations. Whether you have a family recipe or are still developing one for future generations, the fried chicken joints of Maryland will give you a taste of home. With a variety of flavors and textures, here are the 10 best places for fried chicken in the state. Ekiben has made a name for itself in the Baltimore, Maryland, area for its delicious Asian flavors. Fried chicken has recently taken Asia by storm. Now, Asian fried chicken has made its way back to America. The Spice Bird sandwich, prepared with Taiwanese curry fried chicken and Ethiopian spices, is worth a trip to Baltimore on its own. Harvest Fried Chicken makes one main menu item: chicken. Choose between a rotisserie chicken or their juicy, tangy “specialty” fried chicken. They have a wide variety of side dishes and meal deals. Miss Shirley’s Café has recently been showered with accolades, including “Best Sunday Brunch” and “Best for Visitors.” Stop by any of their three locations (two in Baltimore and one in Annapolis) for seasonal diner fare, including their Benne Seed Chicken ‘N Waffles (fried buttermilk boneless breast chicken pieces and a honey mustard aioli drizzle on cheddar green onion waffles). Washington is “a family-owned, intendent, fast casual style restaurant established in Hagerstown, Maryland in 2015.” Since opening, they’ve made quite a splash in the local scene with their made-from-scratch fare. Try their huge chicken tenders, jumbo sized chicken tenders prepared crispy or grilled with your choice of sauce. Matthew’s Grill is bursting with authentic Filipino flavor. They offer a lunch and dinner buffet Wednesday-Saturday and a brunch buffet on Sunday. Their CJ’s Chicken Wings, served with ranch or sweet chili sauce, are delightful. Sardi’s combines tradition southern flavors with the chef’s Peruvian roots. They’ve opened 11 restaurants in the last ten years, a staggering feat on its own. An even more staggering feat? How they get their Chicharoon De Pollo so tender (boneless chicken marinated and deep fried, served with two sides). Milk and Honey Café in Beltsville, Maryland, offers traditional diner food done right. The menu was designed by Celebrity Chef Sammy Davis and is catered largely around breakfast. Their smothered chicken and biscuits, deep fried chicken breast served over jumbo biscuits with egg and cheese covered in Cajun gravy, is our go-to. Fans of Top Chef will recognize Chef Bryan Voltaggio’s touch on the Family Meal menu. The fried chicken is brined with pickles and is available as a breakfast chicken and waffle or for supper, served with biscuits. Nando’s Fried Chicken hails all the way from South Africa bringing bold Portuguese flavors. They’ve already expanded to much of Europe and are coming to take over the American fried chicken business, too. 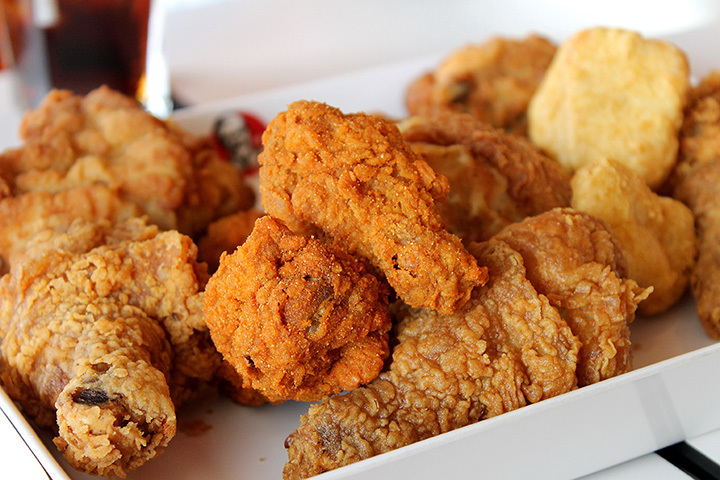 Check out their boneless chicken breast or Peri-Peri wings for fried chicken heaven.